Chef Russell, a product of Contra Costa College's culinary program, has been cooking professionally throughout the Bay Area for over 7 years now. Trained in contemporary American cuisine, yet guided by his appetite for all things delicious, Russell combines his favorite flavors from his own culture, community, travels, and many years in the kitchen into a refined and impressive offering. 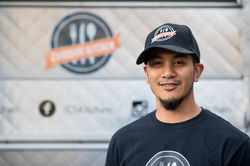 Curbside Kitchen is a gourmet mobile food truck based out of San Pablo, CA. We offer Filipino-American cuisine, with hints of Latin and Southeast Asian flair, served up the good ol' American way.